Armed Fighters Explain Their Motivations Behind Aid Worker Attacks : Goats and Soda In the first study of its kind, researchers ask members of al-Shabab, the Haqqani network and the Taliban to explain why they attack the humanitarians trying to help them. 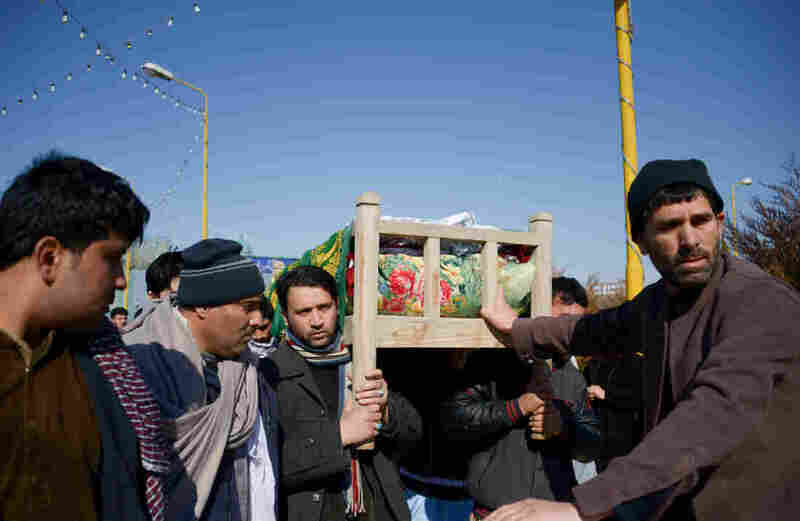 Mourners carry the coffin of one of six Afghan employees of the Red Cross killed in an attack in a remote northern province in February. Now we can finally begin to answer that question. For the first time, researchers asked some of the perpetrators to justify their hostile attitudes toward aid operations. The responses were published in an annual report on aid worker attacks by the research group Humanitarian Outcomes. Interviewers talked to 40 former and current members of three militant organizations unaffiliated with the government: al-Shabab in Somalia and the Haqqani network and the Taliban in Afghanistan. It's groups like these — called "non-state armed groups" by the international community — that commit the majority of deliberate attacks on humanitarians. Between 2011 and 2016, they carried out 73 percent of the 1,083 aid worker attacks recorded. Most of the victims are national staffers who come from the countries where they work. Local researchers from The Liaison Office in Afghanistan and Hikmah Consulting in Somalia worked with community members in different provinces to identify the fighters and arrange the interviews, conducted by telephone. One of the questions they asked: Is it ever legitimate to use force against aid groups? Their answers revealed a range of motivations behind the hostility — as well as their views of the humanitarian sector. The names of the interviewees were not included in the report. Perhaps the most disturbing reason given is that harming aid workers is seen as "a perk for younger members who aren't paid regularly," says Abby Stoddard, one of the main authors of the study. "Letting them commit the violence occasionally is a kind of payment." The responses from the fighters shed light on a topic that the aid community has little data on. "People make assumptions [about aid worker attacks] based on a lack of detailed investigations and follow-up," says Julia Brooks, a legal research associate at the Harvard Humanitarian Initiative, an academic center at Harvard University that studies disaster response. "One of the common assumptions is that [aid worker attacks] emanate from anti-Western sentiment. But the study shows the motives vary." In Afghanistan, for example, the U.S. distributed humanitarian aid to "win hearts and minds" during the war, says Chetcuti. The U.S. government, according to a 2015 paper by academics at Brown University, hoped that providing food, water, education and health care would build trust and confidence among the local population. "I can see how non-state actors would see international aid as a proxy to Western politics or military agendas," she says. And sometimes aid groups do things that make them look suspicious. In a hostile environment, humanitarian workers may try to keep a low profile to avoid being a target, explains Stoddard. So workers may be told not to carry IDs. An aid group's branding may be removed from packaging, clothing and other materials. And they may be told to drive unmarked vehicles. "But operating this way can add to mistrust and create a vicious circle of insecurity," she says. Options for humanitarian workers to protect themselves in dangerous territory are limited, says Stoddard. "They can reach out to those threat sources and try to negotiate, help them understand why they're there." But that can only go so far. Currently, armed groups attack humanitarians with impunity. Chetcuti, for example, is still seeking justice for the 17 Action Against Hunger staffers who were shot in Sri Lanka by security forces 11 years ago. Countries and governments have to do their part to protect aid groups, too, says Brooks. "When there's no cost to armed groups to attack aid workers, it's not surprising that the violence continues."